On a gorgeous Saturday, June 2, 2012, ForgottenTour 54 met at Broadway and Wall Street and explored Trinity Cemetery and the entire length of Wall Street, finishing at South Street Seaport. 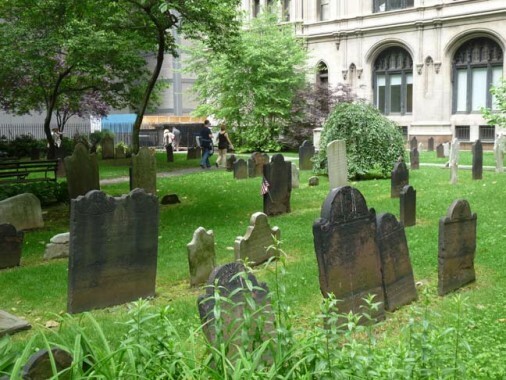 The first mention of this space as a burial ground was in 1673, over twenty years before the first Trinity Church was built from 1696-1697 when a small group of Anglicans living in Manhattan petitioned Governor Benjamin Fletcher for approval to purchase land for a new church. 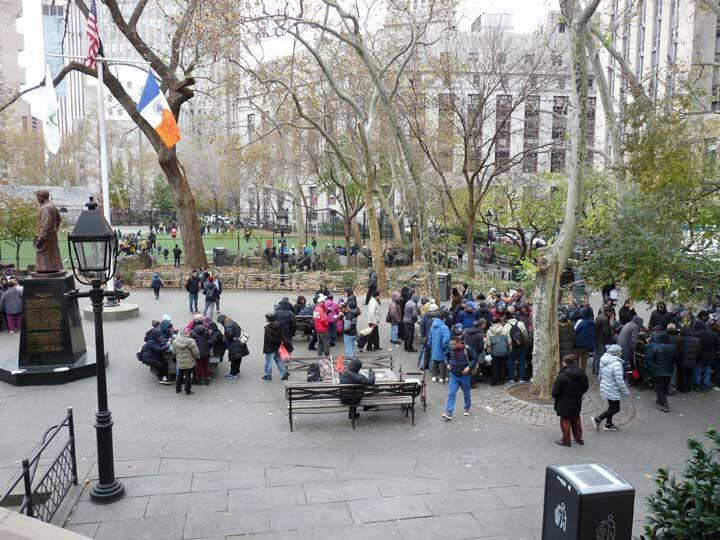 Approval was granted and the petitioners purchased land for the new church from the Lutheran Congregation in Manhattan. That first church was burned down during a 1776 fire begun by invading British forces. The second church was built between 1788-1790, surviving another great fire in 1835, but was found to be inadequate for the needs of a growing body of worshippers, and so the third church, the neo-Gothic structure designed by Richard Upjohn, was consecrated in 1846. For many years, it was the tallest building in the city. The adjoining memorial chapel built from 1912-1913. On September 16, 1920, person or persons unknown exploded a bomb in front of 23 Wall Street, then as now the offices of J.P. Morgan Inc., causing 400 injuries, some of them horrific, and 33 deaths. 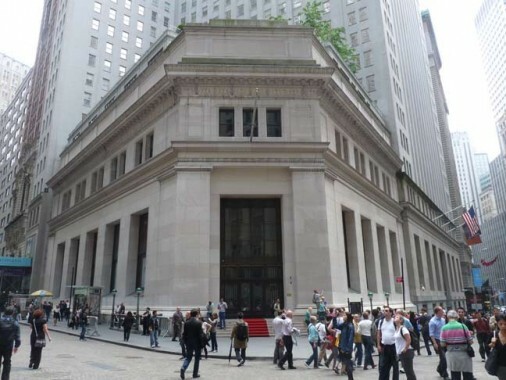 When 23 Wall Street was constructed in 1913-1914, the Morgan name was so well-known that it was considered unnecessary to mark the building with his name, and it continues to be unmarked today…except in one respect. The exterior of 23 Wall Street is weirdly pockmarked on the Wall Street side. These marks were put there by the bombs that exploded on September 16, 1920. Morgan, Inc. has never repaired the building facade. Before the Morgan Bank was built here, at this corner was Downing’s Oyster House, a popular restaurant with financiers, politicians and journalists in pre-Civil War days. (Charles Dickens ate here on his visit to New York.) The African-American owner, Thomas Downing, helped slaves escape to freedom as part of the Underground Railroad. He may or may not be the namesake of Downing Street in Greenwich Village. 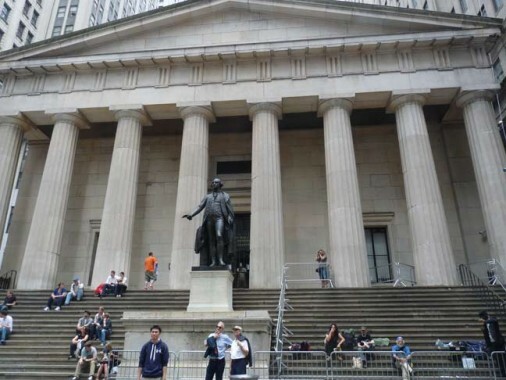 The Federal Hall National Memorial, at 28 Wall Street where it meets Broad and Nassau Streets across the way from the New York Stock Exchange, is an imposing Greek Revival building resembling the Parthenon in Athens. 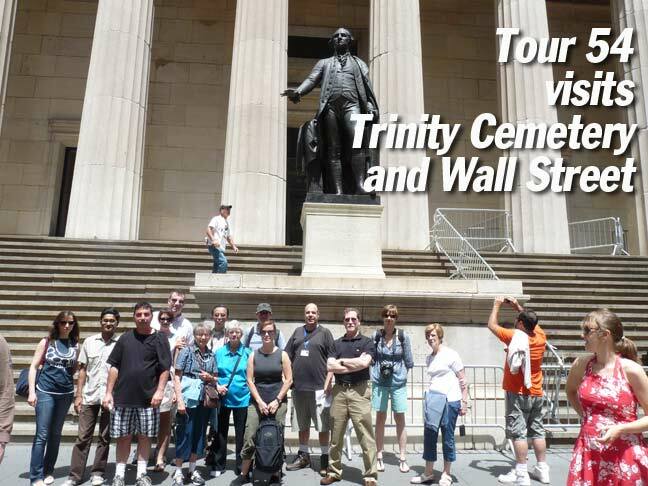 It takes its name from the old Federal Hall which stood here from 1701 until 1812. That building was New York City’s first City Hall; it witnessed Peter Zenger’s trial and acquittal in 1735 for libel against the royal government that laid the groundwork for the principle of freedom of the press; representatives of nine colonies met here to protest the Stamp Act in 1765; five sessions of the Second Continental Congress met here between 1785 and 1789; and Federal Hall served as the United States Capital from 1789 to 1790. Congress met for the first time on March 4, 1789 and tabulated the ballots for George Washington’s unanimous election, and on April 30 of that year, George Washington took his oath as president just about where his imposing statue by John Quincy Adams Ward would be installed in 1883. Federal Hall gradually fell into disuse and disrepair, and it was sold and subsequently demolished in 1812. Thirty years later, in 1842, the United States Customs House was built on the spot, joining the likewise Greek Revival U.S. Assay Office that had been built from 1823-1826. The old Assay Office was demolished in 1915, but it’s still recalled by a sidewalk plaque, and its façade was dismantled and later reconstructed in the Metropolitan Museum on Fifth Avenue. John Quincy Adams Ward’s monumental Washington sculpture was dedicated in 1883. There is a smaller bas relief of Washington in prayer at Valley Forge on the right side of the steps, dated 1907. 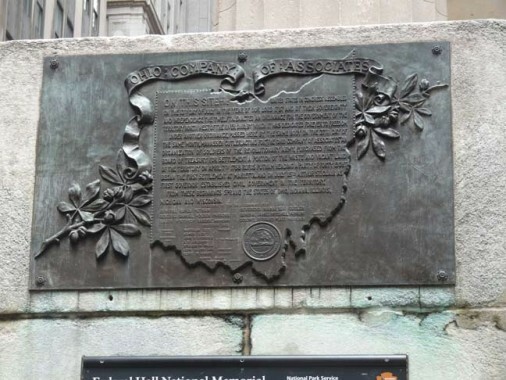 Most intrigiung from a Forgotten NY point of view about the Federal Hall National Monument is a plaque on the Nassau Street end depicting the state of Ohio. With all the history that has occurred here since 1701…why Ohio? The answer lies in America’s desire for westward expansion that would be later distilled by a phrase coined in 1845 by Democratic Review editor John O’Sullivan, envisioning an America that would extend from the Atlantic to the Pacific, to be its “manifest destiny.” Yet as early as 1786, some Americans were already making plans to extend our boundaries west. An organization called the Ohio Company of Associates, consisting of former revolutionary war officers and Massachusetts soldiers, was formed that year to plan the purchase and settlement of lands along the Ohio River, sending Massachusetts attorney and minister Manasseh Cutler to negotiate with Congress, which would soon pass the Northwest Ordinance in 1787 that divided the western lands into territories. Cutler and partner William Duer negotiated two contracts that led to the settlement of Ohio with the first settlement at Marietta in 1788. George Washington had already surveyed lands in the Ohio River Valley by 1770. After the Revolutionary War, those loyal to the union were not paid with cash but with warrants for land in this so-called Northwest territory. The Northwest Ordinance ceded ownership of the territory to the U.S. Government and so became the template by which western lands were settled and later divided into states. Ohio itself would become a state in 1803 with its first capital at Chillicothe. The plaque at Federal Hall commemorates the Ohio Company. Why didn’t you post photos of the interior of Trinity Church? The headstones in the grave yard may be fascinating but the stained glass windows of Trinity Church are magnificent. The fact that they weren’t damaged when the WTC collapsed on 9/11/01 is nothing short of miraculous. We didn’t go in. The church itself would need its own tour. I used to work for JP Morgan at 23 Wall Street. However, this venerable edifice no longer is the firm’s HQ nor does it serve as any sort of bank. About ten years ago, 23 Wall and the adjoining, connected 15 Broad Street were turned into co-op apartments. There’s a rooftop garden for the tenants atop 23 Wall now. 23 Wall Street no longer serves as offices for J.P Morgan, having been sold a couple of times in recent years, with the ultimate goal of turning it into retail space. The plaque re Ohio represents an even more arcane underground feature. In 1803, the US Land Patent Office didn’t yet exist since the Land Grant Act hadn’t yet been legislated into existence; hence, no official record keeping of the original land patent title and the granting of title to, in this case, the military personnel that settled Marietta. The Northwest Ordinance was theoretically a substitute for a land grant act, but that still would have required, at the very least, some kind of creative writing of an enabling act prefatory to the admission of Ohio into statehood. Not done. So. 150 years later, the theretofore military enclave that had come to thought of as the State of Ohio tried its hand at cobbling together an enabling act; they still didn’t get it right. Ohio, thus, remains, as shown on appropriate maps, as a massive military enclave. Is it a state yet? Popular vote doesn’t count. Wise old saying, applied here: Measure twice, cut once. This is such a great article. I have visited the sites but never knew so much about the customs house and the site! Nice piece of history, but you did not mention a very important figure, buried at Trinity Cemetery, that of Alexander Hamilton, a quintessential New Yorker, a founding father, and a man who has left an indefinable influence on America’s economic, political, and military infrastructure. Hamilton and Franklin are the on non Presidents to appear on our Dollar bills in circulation.